To help IEN celebrate its 40th anniversary, Conrad Business Supplies is giving readers the chance to win a Fluke VT04 visual infrared thermometer. This new handheld instrument combines a convenient a spot thermometer with an infrared camera that displays an informative thermal map. The winner of Conrad's VT04 from Fluke will be able to analyse system thermal behaviour quickly and visualise a solution, using the thermal map to pinpoint the source of any problem such as an imbalance or overheating. The Fluke VT04's focus-free infrared camera presents clear images on the generously-sized built-in display allowing instant diagnosis. The spot thermometer gives a fast and accurate digital reading wherever temperature monitoring or verification is needed. 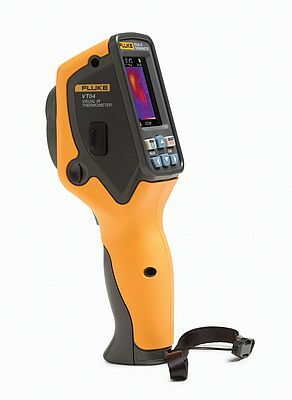 Offering the best-in-class field of view (28° x 28°) and ultra-sharp images, the Fluke VT04 is easy to use, blends digital and thermal images at the touch of a button, and has powerful features include reporting software, hot-spot/cold-spot tracking, and an alarm to capture images automatically when a user-selected temperature threshold is reached. This time Conrad gives one Fluke VT04's away. But anyone can be a winner because Conrad is supplying this instrument for just a little over €800. Conrad offers great value throughout its broad portfolio of products, which covers an extensive selection of electronic components and production tools, as well as the latest consumer, computer and communications technology. To enter the competition, simply go to our online reader service using the five digit reader service number indicated below. Deadline is May 9, 2014. Good luck!